This is such a fantastic weekend course !! It was super intense and I learnt a hell of a lot, nothing beats sculpting from a live model and producing a fresh sketch of their figure. I walked away with a terracotta torso which I've hollowed out and is now ready to be fired in the kiln,. Such a unique piece of work! This course was INCREDIBLE- highlight of the year. Livia is so talented and has teaching skills to help any ability. 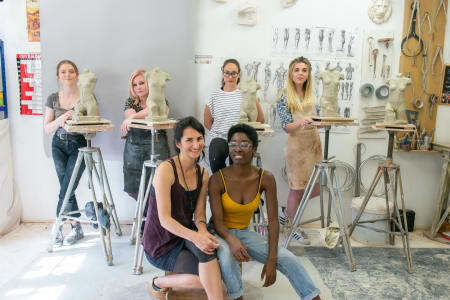 She took our class of sculptors and taught us SO much. 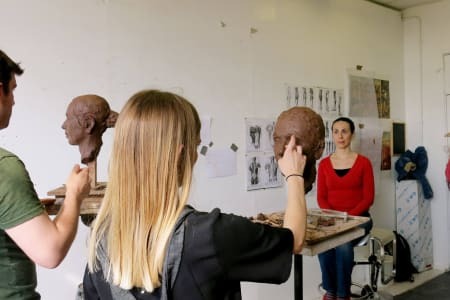 I am sure this course will benefit my sculpting career and grow my knowledge of anatomy but more importantly it has reignited my love for sculpture. Livia teaches with such passion you cannot help but come away refreshed and revived. I highly recommend this to anyone interested in sculpture whether as a hobbyist or as an experienced professional Livia will have much to teach you. I've learnt so much from Livia. She's able to quickly identify where you are going wrong with a sculpture and give perceptive advice which puts you back on the right track. This efficiency means you are able to achieve a lot in a session. Her knowledge of anatomy is extensive and she is always right! Being a former Madame Tussauds sculptor, she's able to cater for all abilities and tutor you right up to hyper realism if thats what you're aiming for, so even very experienced sculptors can learn a hell of a lot from her. 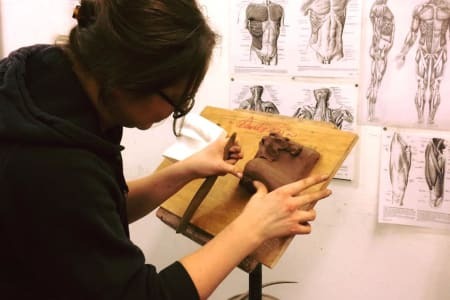 Her classes are always fun and relaxed, but focused, you are there to learn!I would love to be a sculptor one day and this course has dramatically improved my anatomical knowledge! As a returner to life modelling after a long break,this was a perfect class to re connect. Livia is a great teacher,knowledgeable, direct and encouraging. The class was small so each student got plenty of attention during 2 days. It was an intensive and productive course that I would recommend to anyone wishing to study the figure in more depth. Really looking forward to future courses that I plan to attend. Absolutely fantastic workshop. Livia is an amazing sculptor and passionate about teaching and ensuring that everyone gets the most out of the two days. She picks students up at the level they are at and since the classes are small, she is able to give lots of one-to-one attention to every student. Livia is also an incredibly likeable person, who creates a fun and focused learning environment. I loved every minute of the workshop and can't wait to do more classes with her!! I had a real blast at the weekend life modelling class with Livia Turco from the Figurative Sculpture School. She is an absolute talented and inspiring teacher and I have learnt a lot with her. Her attention to details is impecable and I would definitely recommend Livia's classes. A GREAT introduction to sculpture which isn't just one evening. The longer course allowed me to get to grips with sculpting techniques and pace myself. You do learn more from trial and error and you get more practice. You don't feel rushed until the last day. Finished or not it's still a great sense of accomplishment. 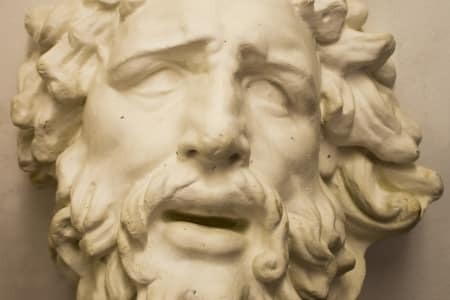 I chose not to pay for the bust to be fired and glazed because I felt it wasn't something I wanted to keep - what am I going to do with with a huge Roman bust? It's solid clay so it was also very heavy. It was great to have the option. Livia is an absolutely wonderful tutor. Very patient, very experienced, kind and encouraging. She has a wealth of knowledge and if you are struggling to correct something she will tell you how to better approach fixing it, or if you are frustrated then she will do it with you. She's always watching and giving you tips and pointers. Superb course ! Would highly recommend it to anyone serious about figurative sculpture. Livia is a very talented sculptor and teacher. The atmosphere is friendly but businesslike. Caters for a variety of skill levels. A wonderful experience where you learn allot. Good fun and very worthwhile. I have had the pleasure of being taught by Livia for the past year. I created a life size figure in a fairly difficult pose. It was my first life size figure after only having created a half life torso, also taught by Livia. I would not have been able to have improved and developed my sculpting abilities without the sensitivity and understanding of Livia. She is incredibly knowledgable, making sure her students have a basic understanding of anatomy to develop whilst sculpting. Livia works with the individual, adapting her teaching to the style of the student, which helps students learn and develop at a faster rate. I could not have asked for a better or more qualified tutor to help me through my final year of my degree. This my second course with Livia. Very good ! Highly recommend it. Freindly but demanding, a real must for anyone seriously interested in figurative sculpture. Livia is a fabulous teacher. Brilliant course ! An amazing course by a talented inspiring teacher. I took the week long half lifesize figure sculpting course with Livia and can feel the benefits in my sculpting already. Livia can quickly identify areas you need to work on and help you resolve them. Livia has really got the balance right of allowing you to get on and sculpt and stepping in to critic. I would really recommend this course if you want to improve your sculpting skills as well as your anatomical knowledge. Such a great evening at the Figurative Sculpture School. I’ve never sculpted before but am very interested in exploring my creative side a bit more, so signed up for this without really knowing what to expect. I’m so glad I did! We modelled a little bit of Michelangelo’s ‘David’ (I got the nose!)... the amount of thought and creativity that goes into sculpting a nose is very surprising! Livia is a wonderful tutor, she gives you just the right amount of information to get you going and helps you all the way through, but you really feel like you’re doing it all for yourself. I’d heartily recommend! What a great time I had with Livia. I have no sculpture experience and she was kind and patient with me. I really really enjoyed my class and would highly recommend it.A fantastic experience and one of the best things I have done in London. I loved this class! I learned a lot and had fun too. Livia was funny, a supportive teacher and provided a really positive environment to learn. Would totally recommend! Had a great time doing this sculpting workshop and would really recommend the course to anyone interested in learning how to sculpt or fancies doing something creative. Livia is a great teacher and you have a real sense of accomplishment at the end of the workshop. There is a really fun atmosphere in the studio, will definitely be coming back again. I had a fantastic evening at the Figurative school. Not only I learnt a few tricks about sculpture but I also enjoyed playing with clay and trying to make something from scratch. I would definitely recommend it . 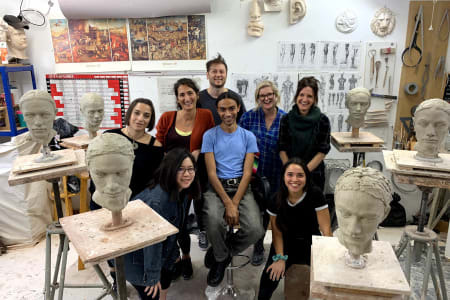 Livia is an exceptional tutor, spending 12hrs working at her weekend class on a portrait was great fun and I absorbed her knowledge on sculpture! Was happy with the result at the end of the class! I was feeling nervous before the weekend course as I had never done sculpting or worked with clay before. From the first minutes of the course, Livia made each of us feel comfortable and settled a friendly and relaxed atmosphere. She had very precise advice and valuable tips that allow each of us to progress with our portrait. It was fun but also an "eye opener"...literally... as the observation tips that Livia gave us made me realise that seeing volume, shapes, lines is an active process. I would recommend this course to anyone : I learnt new skills, I met nice people, I had some delicious homemade cake, .... Overall a very well spent weekend. ruly an irreplaceable tutor. Livia has taught me so much in the short time I've spent with her. In three short projects, I feel confident enough to carry on sculpting. Unfortunately I no longer have Livia as a tutor and am very envious of previous students that were given access to her wealth of knowledge throughout their degree. Livia forms an instant bond with her students and creates a humorous atmosphere but somehow maintains an environment, where teaching and education prevail. I hope I stay in contact with Livia and am very thankful for all that she has taught me. This was a fantastic introduction to sculpting for me. The class was the right size and included a range of talent and Livia was excellent in tailoring her approach to each student. She taught well and I learned some excellent technique. Time seemed to fly by. Would I go again? - Absolutely! Livia is such a brilliant teacher and I left on Sunday feeling like I'd achieved a lot in the two days and really improved my sculpting! A really fun and challenging weekend and I will definitely be booking another class soon!! Sculpture Beginners Class, copy of a cast.